"A no-bake Tex-Mex dip for chips done in layers in a shallow dish." Spread refried beans in the bottom of a (1-quart) shallow edged serving dish (you can use a transparent dish if you'd like). Sprinkle the seasoning packet over the beans. Layer the diced tomatoes over the beans, the sour cream over the tomatoes, and the guacamole over the sour cream. 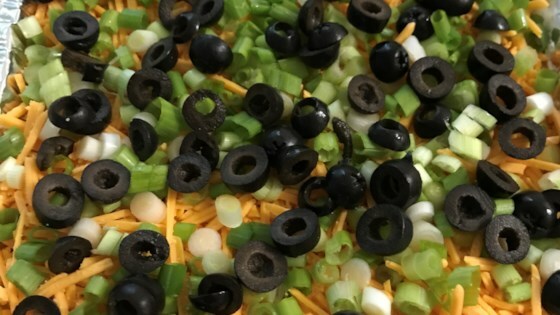 Sprinkle the entire layered dip with cheddar cheese, followed by green onion and finishing it off with a layer of black olives. Cover and refrigerate until ready to serve. I added the taco seasoning to the sour cream and used canned diced tomatoes (to make it easier). It was ABSOLUTELY delicious and a definite crowd-pleaser. This is a decent start to the recipe i use. I mix the taco seasoning with 1 cup of sour cream and 1/2 cup of mayo..this lets the taco seasoning shine without overbearing the other ingredients. I make this often and my family loves it. I would suggest mixing the taco seasoning into the refried beans. My Bunko group loved this dip! Great vegitarian alternative to seven layer dip.